When Germany invaded Poland in 1939, the U.S. Army general staff was well aware that the U.S. could soon be involved in a war with Germany or Japan. It might have to defend itself against a powerful Germany bent on invading our hemisphere in an ambitious march to subjugate the world. One of the strategic needs for defense of our hemisphere would be reliable maps of poorly charted and unexplored areas of the Arctic and the forested and undeveloped areas of Central and South America. The establishment of the 1st Photographic Squadron in early 1940 was therefore authorized to undertake the role of remedying this strategic deficiency. Geodesy became an indispensable link in the United States Army and Army Air Force reconnaissance collective. The geodet would go out in the field and take measurements that would be incorporated by photography units for accurate mapping. Geodesy depends on a variety of instruments and techniques for the accurate determination of points on the earth’s surface. After French-made prismatic astrolabes became unavailable with the fall of France to German forces, an American version of the instrument, the equiangulator, was designed and built by the Eastman Kodak Company. 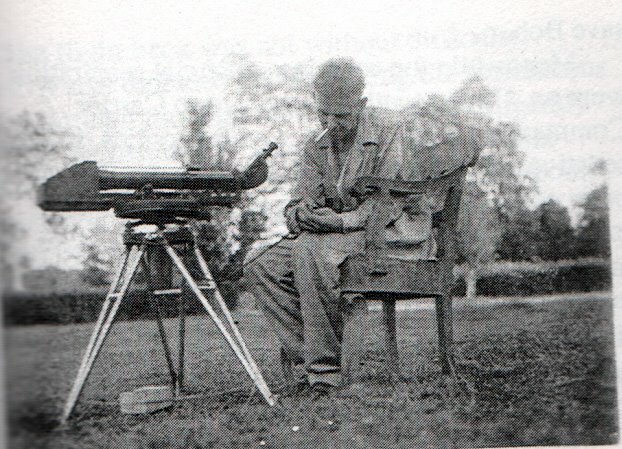 The equiangulator became the geodetic instrument of choice for Army Air Force geodets from 1943 onward. Successful geodesy relied on the establishing of accurate geodetic control points. To determine the longitude and latitude of a geodetic control point, a geodet used an equiangulator to observe a series of stars “at a fixed and invariable angle of 60 degrees.” Looking through the eyepiece, the geodet looked for two images formed by a passing star, one “produced by the light of the observed star that falls on the upper side of the [equiangulator’s] prism and the other image is formed by the light reflected into the underside of the prism from the artificial mercury horizon.” At the moment the two images would meet, a stopwatch was used to record the time of their formation, and that measurement is calibrated with a coded signal from Greenwich, England or the United States Naval Observatory in the District of Columbia. Readings are then recorded into a logbook, and can be used to interpolate other geodetic control points. The trimetrogon camera system was an indispensable element of successful geodesy. Consisting of three cameras placed in a single, static mount, the trimetrogon system allowed accurate and level aerial photography. The trimetrogon utilized three K-3 cameras. One was placed vertically, enabling an direct photograph. 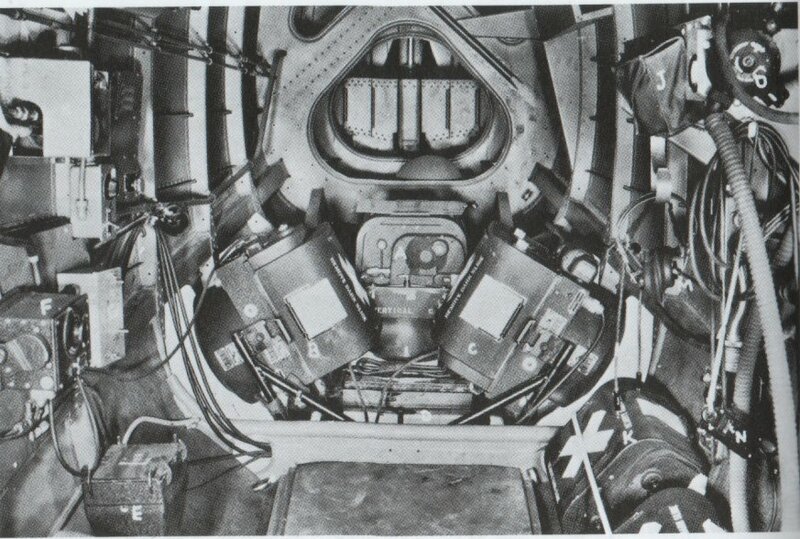 The other two were placed on either side of the vertical camera at oblique 60-degree angles. 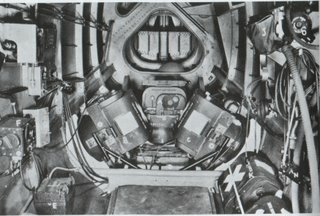 Combined, the three cameras allowed for one vertical photo, and two others depicting the horizon on either side of the aircraft. Successful trimetrogon photography also enabled photo crews to determine the pitch and yaw angles of the aircraft from the photos. Geodets would compare geodetic control point readings with trimetrogon photos to create accurate navigation and target maps. Geodetic and photo crews would thus calibrate the results, referencing specific topological and geographic points on the photos and referencing them to the established geodetic control points. The development of geodetic control systems during World War II had consequences for future military planners. Along with the 1st Photographic Squadron, The Army Map Service (AMS) was created in 1942 as a Field Office of the Army Corps of Engineers. AMS used geodetic data to provide cartographic support for ground forces. Floyd W. Hough, the first appointed head of the AMS, even became a legend in geodet circles. Moving into Germany in 1945, Hough’s team captured tons of geodetic data and cartographic materials in enemy hands. Hough’s most dramatic find, however, was the entire geodetic archives of the German Army, including the military maps and geodetic data that the Germans had captured from the Russians. Hough later utilized his knowledge of world geodetic data for postwar guided missile programs. A meeting with higher-echelon War Department brass noted that “an accurate figure of the earth becomes more and more important to the War Department when we consider the use of guided missiles and other long range weapons.” In August 1947, after further negotiation, the Army General Staff ordered the Chief of Engineers to develop a “Geodesy for Guided Missiles.” The purpose of this secret project was “To establish a rapid method for computing exact azimuths and lengths of long geodetic lines; [and] to resolve to a common datum all existing world wide geodetic surveys.” In the end, such reports led both the AMS and its United States Air Force counterpart, the Aeronautical Chart and Information Center, to develop a series of World Geodetic Systems (WGS’s), each calibrated to a specific guided and ballistic missile program.